In our commitment to help you achieve and maintain youthful-looking and healthy skin, we are presenting our list of the best anti-wrinkle creams for sensitive skin after more than 19 hours of going through and reviewing the top-performing anti-aging creams in the market today. We made sure to assess each product based on their ingredients, ability to prevent or reduce wrinkles and added skin benefits to make sure you only get value to your money. Neutrogena Healthy Skin Anti-Wrinkle Cream is the best wrinkle cream for sensitive skin for a lot of reasons. For one, it already comes with SPF. Apart from that, it's oil-free and fragrance-free. Like, what more can you ask for? 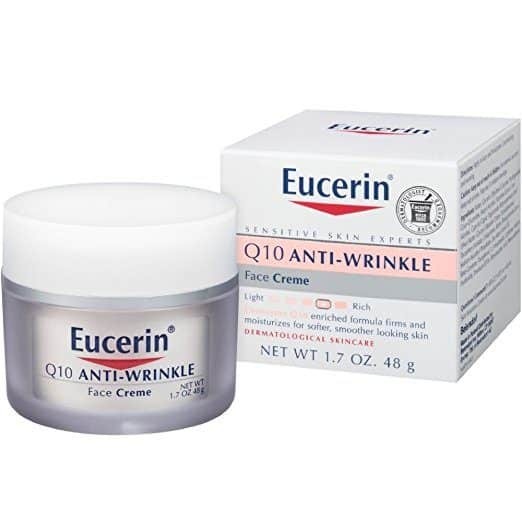 Eucerin Q10 Anti-Wrinkle Sensitive Skin Creme is a good choice if your sensitive skin tends to flake and become patchy. It's thick and very moisturizing. Partnered with potent antioxidants, it promises to make your wrinkles less prominent in just a few weeks. Eva Naturals Retinol Moisturizer contains 2.5% retinol to make your skin smoother and younger-looking. Its moisturizing formula comes in a fancy-looking glass jar. If you are looking for something lightweight, Miracalis Anti-aging Cream is a good choice. It creates a good base for makeup and won't make your cosmetics smudge or budget. It has CoQ10 and vitamin E.
Pond's Anti-Wrinkle Cream is packed with three potent ingredients your aging sensitive skin will love. Apart from Vitamin E, it also has Alpha hydroxy acids and collagen. It is dermatologist-tested so you're assured that it can work with delicate skin. 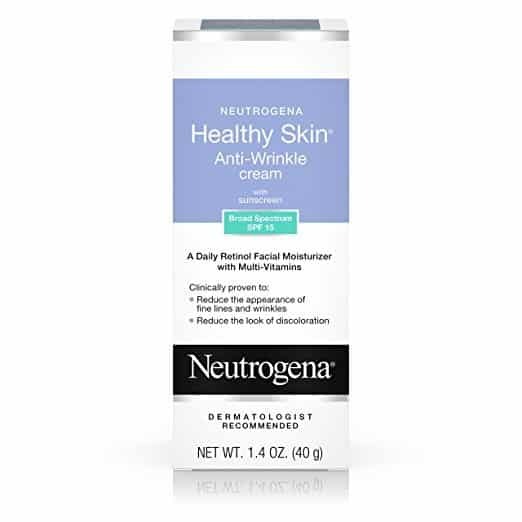 Neutrogena Healthy Skin Anti-Wrinkle Cream is a unique anti-aging product on this list because it already has a broad spectrum SPF rating of 15. Although it isn’t that high, having sun protection is still better than nothing, right? It’s hypoallergenic and fragrance-free. On top of these features, the cream is also non-comedogenic and oil-free which make it the right fit for people who are also dealing with acne problems. What I like about this cream is that it comes in a tube. Not only is it more hygienic, but it’s also a safer choice when it comes to preserving the components of the cream. It is lightweight and spreads easily on the skin. You don’t actually need to use tons of cream, especially with retinol creams. You only need a thin layer of the product to get the best results possible. Eucerin Q10 Anti-Wrinkle Sensitive Skin Creme has a formulation that your sensitive skin will love. It has no fragrance or even alcohol. It’s non-comedogenic, too. What’s interesting about this product is that it’s loaded with potent anti-oxidants. It comes with Beta-carotene, vitamin E and Co-Q10. The cream is a bit thick and you only need a small amount of the product to cover your entire face. For those with flaking and patchy skin, this is the best product to use as it leaves the product extremely moisturized. Now, I know thick creams can be intimidating for those with vulnerable skin as it can result to breakouts. But, keep in mind that this product isn’t occlusive to the skin. Eva Naturals Retinol Moisturizer is a great anti-wrinkle cream for acne-prone sensitive skin. It has 2.5% retinol to fade dark spots, smoothen your skin and diminish your wrinkles. The product comes in a glass jar. It can easily break so make sure to handle the jar carefully. I also wished it came with a darker tint to preserve the product better. It isn’t as thick as the other creams are, but it is definitely moisturizing. The texture makes the product easy to work with. However, like most skin care items,you can’t really expect the cream to work and do its magic right away, especially if your wrinkles are too deep. Miracalis Anti-aging Cream has a medium texture. It gets absorbed fast without the greasy and tacky feeling that comes with most creams. It claims to be clinically proven to reduce the depth of your wrinkles so they can be less noticeable. The cream contains the unique blend of Co-Q10 and vitamin E.
On top of those two ingredients, the product also contains active peptides. It is lightweight and non-greasy. It’s also not scented which is a plus for people with sensitive skin. It absorbs well that it won’t interfere with makeup application. In fact, it actually makes a great makeup base. Pond's Anti-Wrinkle Cream is dermatologist tested and hypoallergenic. It promises to reduce the appearance of fine lines in just two weeks. The product comes with two potent ingredients to live up to its claims. It has Alpha Hydroxy Acids and collagen to fill in fine lines to make sure they don’t get as much attention. Apart from those two, you also get vitamin E.
To get great results, it’s recommended that you use the product twice a day. It can come with a mild tingling sensation, especially when applied right after cleansing. If this happens to you, wait for your skin to dry before applying the cream. Because it has AHA, I suggest you don’t head out into the sun unprotected as it can increase photosensitivity. If you can, try to use the product at night. I have to tell you, however, that the cream is scented. This is actually a big deal breaker, especially if scents belong to your list of triggers. If you can get past these issues, this is still (and definitely) one of the best creams you have to try for your aging skin. Sensitive skin is a bit tricky to care for, especially when it starts to age. Even if you want to slow down the wrinkles, laugh lines and age spots that start to appear on your skin, there’s very little you can do about them. People with sensitive skin often have one thing in mind: They can’t readily use any skincare product on their skin because it’s hyper reactive. They’ll break out in rashes, acne and bumps. The truth, however, is that your skin isn’t the only one that should be taking the blame. Your product choices count, too. It may sound like a cliche, but reading products can help you find the right products for your skin type. It’s not enough to see “hypoallergenic” and “fragrance-free” in the items you buy. You actually have to read product labels and ingredient list. The best anti-aging product for your skin is one that has the least amount of irritants and harsh ingredients. Hydroquinone, for example, is a well-known for its skin lightening properties. Despite the benefits it offers, it might not be a suitable ingredient for sensitive skin since it’s highly potent and irritating. Salicylic acid is another product that should be out of your list. Apart from triggering skin irritation, it can also cause changes in your sensory organs. Now, onto the ingredients that are skin-friendly. These acids are mainly found in fruits as well as milk. One of their functions involves breaking the bond that holds dead skin cells together so that they can easily get rid off. Apart from this function, AHA also triggers the production of elastin and collagen. These two components are essential in keeping the skin supple, elastic and youthful. Vitamin E is considered to be one of the best vitamins for aging skin. It has potent antioxidant benefits that can prevent free radicals from causing damage to your cells. It also works great for sensitive skin since it also has the ability to soothe. Vitamin C is good for sensitive skin- as long as you are able to use the right strength. It can be highly irritating, especially when you use a really potent product. However, when chosen properly, this vitamin can help reduce the appearance of wrinkles and even dark age spots. As you age, your skin becomes more fragile. It can easily get damaged by being exposed to pollution, stress and the sun’s UV rays. Alpha Lipoic Acid can prevent the detrimental effects of these factors by facilitating cellular repair. It can make your pores look smaller while improving your wrinkles. Wrinkle creams, anti-wrinkle creams and anti-aging creams all point out to one thing- slow down the signs of skin aging. Over the years, this skin care item has grown in demand as more and more people became more conscious of how the skin changes with age. Ideally, you should start using anti-wrinkle creams at age 25- even if you can’t see any wrinkles yet. Just think of it as prevention. They should be applied daily. Depending on the formula, you can wear it at night or day. Since they usually come as moisturizers, you won’t have any problem using it as part of your daily skincare routine. To facilitate better absorption, it’s a good idea to massage the product on your skin using gentle upward motions. This also increases blood supply.